This entry is part 3 of 4 in the series WordPress Development Environment. I do most of my WordPress development using a combination of VirtualBox and Ubuntu. Over time I’ve developed a few simple tips that make my workflow a little more efficient, so I wanted to share them with anyone else who read my previous tutorial on setting up a VM as a WordPress development environment. Running VirtualBox takes up a significant amount of RAM, so I like to shut it down when I’m not using it. XAMPP needs to be manually restarted the next time I use the VM, which can be a little tedious after a while. Select “Application in Terminal” for the Type. Enter “Start XAMPP” for the Name (or enter whatever you want to call your shortcut). Enter “sudo /opt/lampp/lampp start” into the Command field. 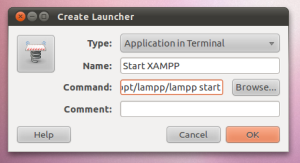 Enter the XAMPP startup command to create a launcher for it. Now your laucher for XAMPP will be on the desktop and save you a few clicks and keypresses when you need to start it up. If you have any other suggestions leave them in the comments! Can you make a tutorial on how to start xamp at startup.